Ever since I posted an article on how to use Twitter to determine your brand strength I wanted to do this experiment – finding the most influential WordPress brand! If you can’t be bothered to read the article, the basic premise is this: if your brand uses Twitter and you follow people who are relevant to your product/market/brand, then the percentage of the people who follow you back is a simple but very effective measure of your brand strength. For example, if I sell blue widgets and follow 100 important people in the blue widget market, and 40 of those follow me back, my current brand strength (reach, influence, if you will) would be 40%. Reaching 100% would be ideal, but it is very hard to accomplish if you are truly honest about following only the influencers in your market. It took me a couple of weeks to build the app, and I couldn’t wait to share the results! Because WordPress market is broad – there are themes and plugins, hosting services, and all kinds of businesses going on – I decided to focus the experiment on companies selling products. Also, I made sure that these Twitter accounts had been thoughtfully created with the intention to follow relevant people to that brand (and not, for example, to follow everyone who follows them). I’ve included a mix of companies in various markets: WooThemes and Elegant Themes for themes; iThemes, WPMU and Rocket Genius (Gravity Forms) for plugins; WPEngine and Page.ly for hosting; ManageWP for management. I also included WPTavern (news) for an independent reference. I then made a union of all of the unique people these brands follow together. These nine brands follow a total of 7,508 unique people, and this represents a relevant sample of the WordPress community for this experiment. I then calculated how many people from that sample follow each of the brands. That would make their global brand strength score in the WordPress community. Due to the limitation of the Twitter API, I could only use several brands at once, so the ones I included were those that I could think of first from the top of my head (excluding Automattic) that fit into the above criteria. The table should be fairly obvious to read. “Refollows from union” column will give you information how many of the 7,508 people follow each brand; next to it in the “Global Brand Strength” column, you can find that value as a percentage. According to these results and based on the criteria I set previously, WPEngine comes up as the number one WordPress brand, followed by more than 30% of this relevant market sample. It also has a significant lead compared to the second place WooThemes, which is followed very closely behind by iThemes and WPTavern. ManageWP scores place #6. I am grateful to simply be on the same list with all of these respectable WordPress companies. To be considered comparable to them would be a big achievement for any WordPress business. 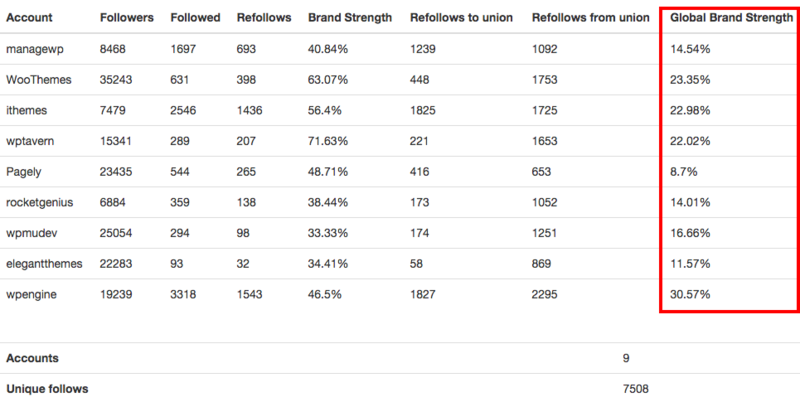 If we look only at the “local” level, refollows from just the people followed by each brand (in the “Brand Strength” column), WPTavern leads here, as 71% of the people they follow, follow them back (207 out of 289). Curiously, Page.ly is #4 according to this criteria, but it is in last place “globally,” which could indicate that they engage a lot with people closely related to their business but do not engage as much with people interested in other kind of WordPress products/services (an opportunity there?). Every brand here is a winner, and the results show that they have been working very hard to create products that capture the imagination of the community. These numbers should be taken as an experiment only – it is just one way of looking at the market. I know that I probably missed some brands, and I am happy to create an updated list in the future. What could also be interesting to do is a similar comparison of WordPress “evangelists,” people who are very well known and popular in the WordPress community. I have a few favorites from the top of my head for that list. If you’d indeed like to see such a list, please let me know your favorites in the comments or by tweeting to @managewp. it is surely a great way to find the best brands based on different social signals. But do you think it will work for smaller brands ? This is certainly a very unique way that you can look at how to rank businesses influence based on social signals. I think that if you where to preform this experiment on a large scale and then compare that with each companies market-share you would have a pretty good estimate of how each company impacts the WordPress Market.